I always find it a little difficult to embellish boy cards, but for this one I used some awesome Jute String from Really Reasonable Ribbon, as well as a button with some Licorice Baker's Twine. I think they make the perfect accents! The dp is from the DCWV pack All About Boys. Really Reasonable Ribbon also has some FABULOUS Blog Candy up for grabs which you can see HERE! You won't want to miss your chance to win! Thank you so much for stopping by and enjoy your weekend! This is just darling Kerri!!! Love that dp! 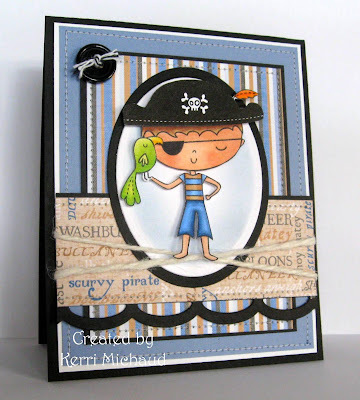 its perfect for this little pirate boy! This is an awesome card for a little boy. I love that image and the jute string is a perfect accent! Um, when I grow up, I want to stamp like you! I just had to come see more of your amazing projects. Your cards are AMAZING!!! Wonderful card Kerri! The image is so cute. SHUT up! This is the CUTEST Kerri!! LOVE him!! Kerri this is the CUTEST! I LOVE that pirate!!! Such a FUN boy card! He's a cutie - looks like these stamps are right up your alley. I love the twine too - - reminds me of the rope that they tie in to knots on boats! I saw your card on Really Reasonable Ribbons Blog and fell in love with it! I love the contrast and all of your amazing detailing...totally awesome! Congratulations on making My Cute Stamps DT, your cards are amazing! This is so stinkin' cute! I love little boy pirate stuff! The jute and licorice twine are just perfect for this card!